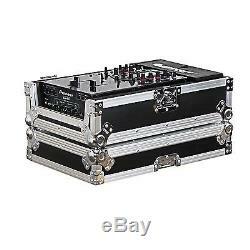 Odyssey FZ10MIX Flight Zone 10 Inch DJ Mixer Universal Travel Case. Odyssey FZ10MIX Flight Zone 10 DJ Mixer Case. Transport your 10 mixer in style with our foam-lined Flight Zone® mixer case. Convenient front panel provides full protection during transit but slides out for access to front mixer controls during use. For additional mixer elevation, you can use the lid as a stacking base, very convenient when using those lower tables or for taller DJs. The FZ10MIXDAI also features easy access to the front controls of your mixer with Odyssey's V-CutT removable front angled panel design. Chrome and Black Exterior Design. Includes Mixer Width Adjustment Strips. Removable Front Access V-CutT Panels. Heavy-Duty Recessed Handle & Latches. Fits mixers 8.75" to 10.875" wide, up to 15.25" deep and 3" tall. The Odyssey FZ10MIX Box Includes. (1) Odyssey FZ10MIX Flight Zone 10 DJ Mixer Case. Thousands of Items in Stock. Any use of this material including all content, images and design, without prior written consent from IDJNOW, is strictly prohibited by law. This listing is currently undergoing maintenance, we apologise for any inconvenience caused. The item "Odyssey FZ10MIX Flight Zone 10 Inch DJ Mixer Universal Travel Case" is in sale since Thursday, December 11, 2014. This item is in the category "Musical Instruments & Gear\Pro Audio Equipment\Cases, Racks & Bags".